If you follow me on Twitter, you've undoubtedly noticed that added to the old mix of quotes from my kids and my thoughts on various snack foods are a lot of retweets of political posts and feminist statements. I'm pretty unhappy about the direction our government is moving, and I'm worried that Trump and his compatriots are bombarding us with a ton of terrible things up front so that we'll get tired and stop resisting. I'm also worried about the general level of stress and anxiety floating around, and I know it's not a sustainable situation. I read this article, "How to Stay Outraged Without Losing Your Mind," which is full of good advice on focusing your energy, making activism fun, and self-care. I'm not sure if my mom read the same article, but she shared with me her idea of how to keep resisting without being angry, anxious, and sad every single day. Her plan is to 1) not read the news first thing in the morning, and 2) calmly make three calls to her legislators every day as part of her routine after lunch. I wanted to figure out a way to incorporate resistance into my daily routine too, but I knew that making daily calls wasn't going to be the answer. I'm a weird hermit and it takes me days to gear up to making a call or two, even with the awesome directions from 5 calls, and then I'm weirdly relieved when I get sent to voicemail--or even when voicemail boxes are full. Inspiration hit with the indomitable Zina Bennion's Jason Chaffetz Mail Campaign (which is Monday, February 27, and something any of you from Utah should absolutely participate in). 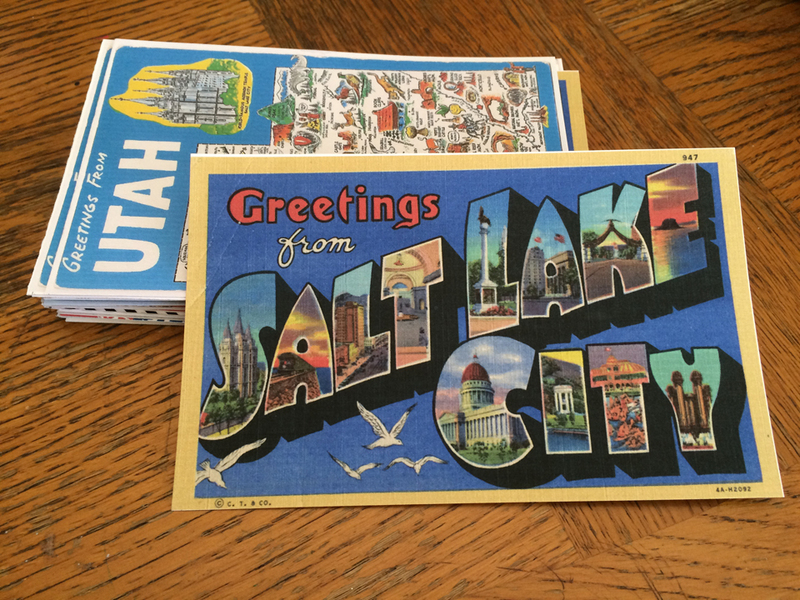 Her idea is a deluge of postcards, showing Chaffetz what real Utah voters actually want. 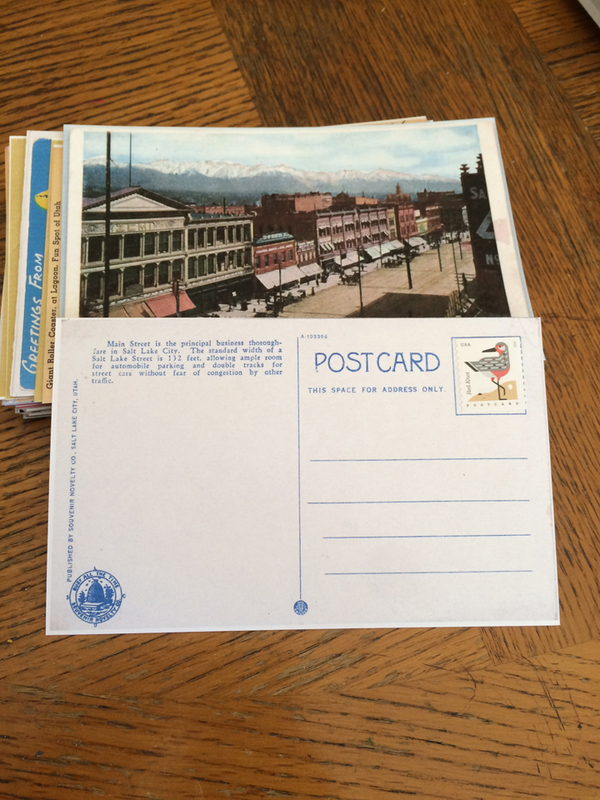 Postcards can be processed more quickly and efficiently than letters in envelopes, and as far as I know a snail-mailbox can't be too full to accept new messages. 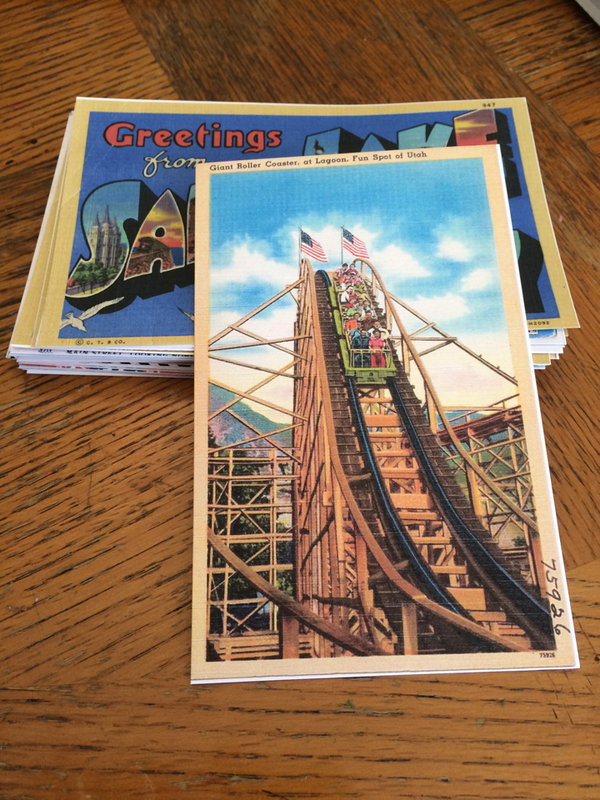 I'm going to start with this campaign, and then keep on writing two or three postcards each day to different legislators about whatever issues I'm currently worried about. On the Facebook page for the Chaffetz mail campaign, Zina posted a link to a Design Crush post full of fun, printable, artist-designed postcards especially for this purpose. There's also a PDF there for a universal postcard back. 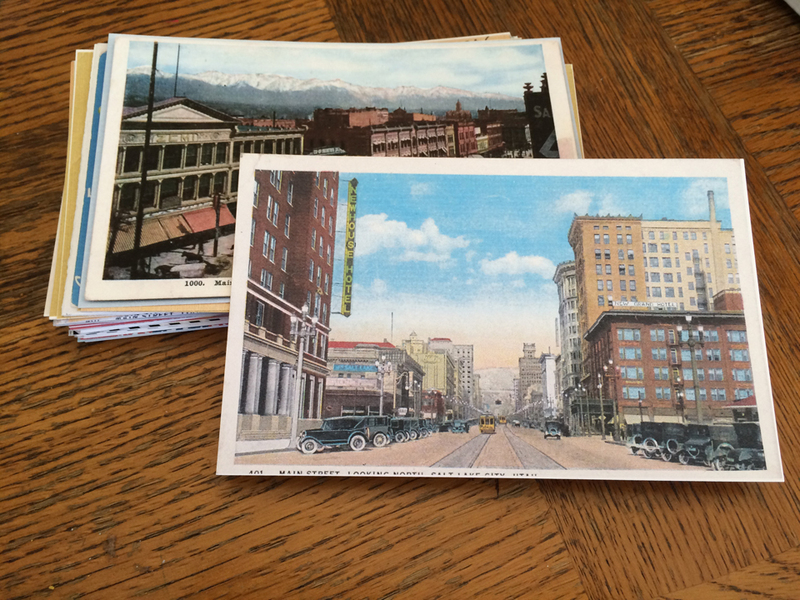 I also wanted some retro, Utah-specific postcards to underscore where my comments are coming from, so I dropped some scans of old postcards into the same template for easy printing. As far as I can tell these are old enough to be public domain images, so I'm posting the files here if anyone wants to download them. 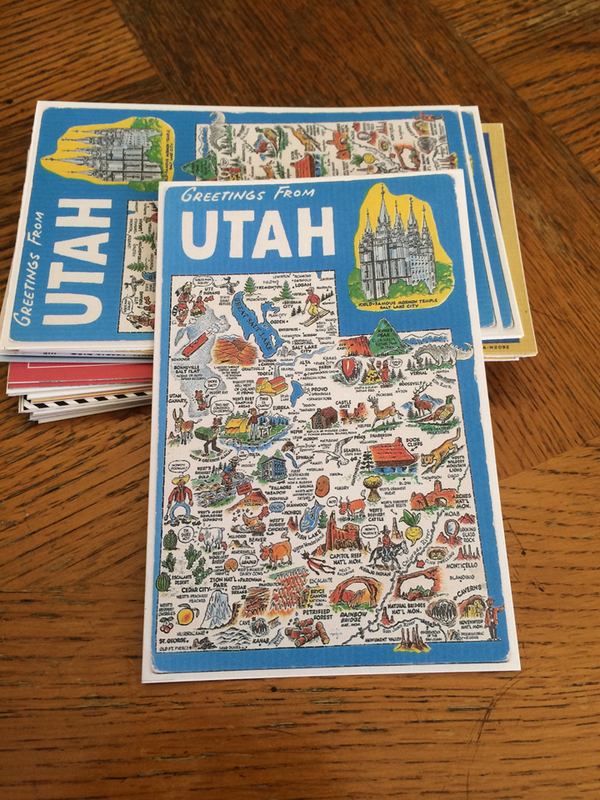 There's a Utah map, one with illustrated letters spelling 'Salt Lake City,' the old Lagoon roller coaster, and two of Salt Lake's Main Street from different time periods. I had a scan of the back of one of the Main Street postcards, so I dropped that into the template too and printed it on the back of both of those two. I knew it was going to take me weeks to get around to going to the office supply store, so I ordered some 110-lb. cardstock on Amazon Prime and a roll of postcard stamps from the USPS website. I was exercising self-care by not giving myself more errands to run, okay? If you care a lot about professional-quality printing, and cards you print yourself are going to bug you because the fronts and backs are slightly off or the cutting isn't perfect, I recommend buying some cool postcards like these from Anderson Design Group to make the task more pleasurable. I would love to hear what postcards you think I should write, or what you're doing to take care of yourself while also trying to take care of our social programs and our country.